TAOISEACH LEO VARADKAR has conducted a mini-reshuffle of his Cabinet, with Richard Bruton taking on the position left vacant by the departing Denis Naughten. Bruton has been nominated as the new Minister for Communications, Climate Action and Environment after Naughten’s resignation on Thursday. In a statement today, the Taoiseach also announced other appointments, with Independent TD Sean Canney being made Minister of State for Rural Affairs and Natural Resources. Sean Kyne has also been appointed as Government Chief Whip and Minister for the Gaeltacht. Explaining the reasoning behind the Taoiseach’s decision to move Bruton, government sources state that Bruton’s ministerial experience was thought to be crucial in giving him responsibility for the National Broadband Plan. Looking forward to this new challenge, working on some of the most crucial issues currently facing the country. I am committed to implementing the National Broadband Plan, which will deliver broadband to over 500,000 homes, schools and businesses across the country. The return of Canney to the Cabinet table is also thought to ensure that he will continue to vote with the government after he departed the Independent Alliance in a row over his rotating ministry with Kevin ‘Boxer’ Moran. The reshuffle also provides a greater rural balance at Cabinet with Galway and Donegal now having representation in the form of Kyne and McHugh respectively. When asked why there were no women included in the shuffle, a government spokesperson said that a significant change with more gender balance would most likely take place when the Taoiseach reshuffles the cabinet properly, today’s change being necessitated by the departure of Naughten. Email “Mini-reshuffle sees a change for Richard Bruton and two seats for the west at Cabinet”. 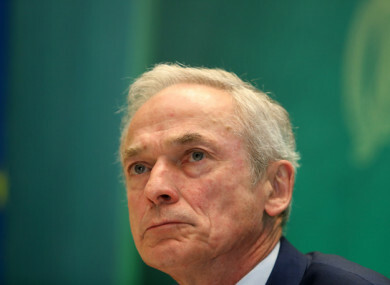 Feedback on “Mini-reshuffle sees a change for Richard Bruton and two seats for the west at Cabinet”.